We've all had that unpleasant experience: you receive a bottle of perfume as a gift, spray it on, and realize it, ugh, smells more like something that's been sitting in your grandmother's dresser since World War II than something you would wear. Just goes to show, some scent education is definitely in order. For this, we turn to Zen Zest president and CEO Michelle Asence-Fontelera, who says, "The scent will depend on the personality of the giver, but as much as possible, [give] something more universal. Something mild, because that's what everybody will like." Michelle certainly knows her scents; she has also ventured into turning eau de toilettes, room fragrances, linen sprays, diffusers, and colognes into charming giveaways or souvenirs for weddings or birthdays, or even Christmas presents (which will come in handy, with the -ber months officially starting in a few days!). 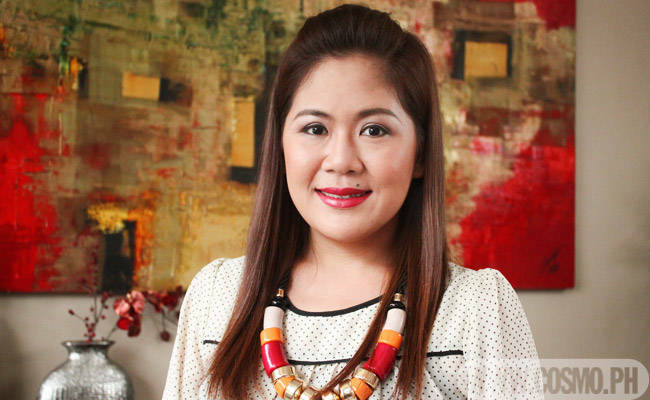 A pioneer in the local fragrance industry, this entrepreneur and exporter has proven the profitability of perfume-making, providing budget-conscious and spend-savvy Pinays with more affordable options. And when we got the chance to chat with her, we just had to get firsthand advice on picking the perf scent, making it last, and making it work for you. Check out her answers during our exclusive interview. What scents are big right now? The mild scents, citrusy scents like orange honeysuckle, and white musk. For room scents, lavender mixed with vanilla or rose. Something to give it a twist. How many scents does Zen Zest have right now? Hundreds! [For the personalized scents], it's really affordable. Our prices start at P250 per perfume and up. Our most expensive is [around] P1,600. How do you pick a perfume that matches your body chemistry the best? If you're choosing a fragrance for [yourself], for your personal use, you have to spray it on your pulse point, your wrist. Go around the mall and after 20 minutes, whatever scent that lingers on your skin, that's how the fragrance will react to your body chemistry. What would you advise girls use? For the day, I recommend cologne lang and at night, if you're going out, if you have a special occasion, perfume is the best. Is it advisable to also spray the scent on your clothes? [Perfume or cologne] really lasts longer on fabric. [But] it depends on the weather. During summer, because people tend to perspire more, perfume or cologne-wearers need to re-apply every few hours to keep the scent. Have you had any perfume-related mishaps? Nangyari sa akin, nag-stain 'yung perfume [on my blouse], so the fragrance content must have been high. The oil was high so it was a bit oily. The whole day, meron akong mga spots [on my satin top]. [They were] washed out in hot water, though. How can you check if a perfume won't stain clothes? Rub it [on your skin] and if it's a little bit oily, don't take the risk to spray it on satin clothes or fabrics, any delicate fabric. How long do perfumes generally last? How can you make perfume last longer? You can put it in the fridge para mas fresh. How about making the scent stay longer? Better if you match [your] lotion with the perfume to make the fragrance last longer. It's called "layering of scents". If you can't find a lotion that matches your fragrance, you can find a very mild-scented lotion or non-scented lotion. When you put lotion, and you apply fragrance, it will stay longer, because your skin is already moisturized.